CREATE A SPACE THAT YOUR GUESTS WILL NEVER WANT TO LEAVE! - Design Home Interiors, Mark Little - The best interior design services in Montgomery County and Bucks County and suburbs of Philadelphia. CREATE A SPACE THAT YOUR GUESTS WILL NEVER WANT TO LEAVE! Could your dining room use a little extra pizzazz, but you don't want to redecorate the entire room and start from scratch? We've got some ideas to liven things up, and give meal times a little more oomph. 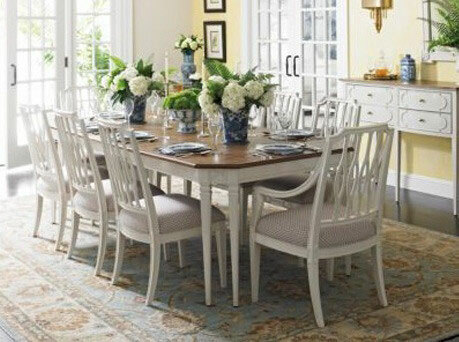 - Enlist your dining room to serve double duty. Select a table and chairs that are casual enough for everyday activities - breakfast, doing homework, or putting together puzzles - but can be easily dressed up for entertaining. - You may have a set of dining chairs right now that all match. Change up the end chairs a bit – Adding two upholstered chairs to your set can make a drastic difference to the room. Choose a fun whimsical fabric that makes them more interesting and playful. - Happy with your dining set but need something more? Mix styles with a mod, multifunctional sideboard or make a statement with a graphic rug or piece of artwork. Incorporate a transitional light fixture that becomes the focal point of the space. You should enjoy every space in your home. Sometimes all it takes a little revamping to bring a lackluster room back to life. Come enjoy an evening filled with style and luxury. Celebrate 10 years with us, get a sneak peek of upcoming fabric and design trends for 2014, and get an exclusive look at the newest additions to our showroom. Be sure to mark your calendars – this is an event you won’t want to miss!